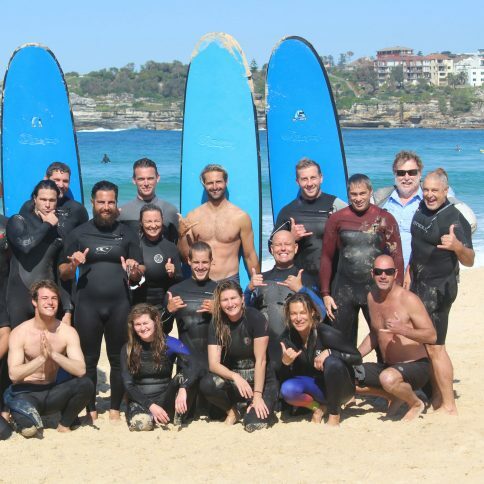 Being a Surf Instructor is a dream job!! Spending hours on the beach, sunshine, happy times, clear water and getting to share the stoke of surfing with people from all over the world! Doesn’t get any better right? Well, some might forget that LGS coaches do up to 5 lessons a day (one of our most respected coaches, Shannon has done 7 on one day!). That is a lot of physical work, carrying big 9ft boards along the beach, pushing adults on to waves and entertaining the kids in the afterschool programs…phew no wonder we have to stay so fit. Last Monday was the day the LGS team looks forward to every year, or do we? We get down to the beach for the re qualification of our First Aid and OSSCA! It makes for a good get together, cheer each other on so we can push ourselves to the limit and break our personal best..
8am we met at the pool to partake in a 500m pool swim which had to be done under 10 minutes! That’s not all for the day, we were then off to Bondi for the classic swim, run, paddle, run (all 300m). The rest of the afternoon is filled with the latest First Aid and CPR training. Every year this day makes for great moments so enjoy a bit of behind the scenes of Let’s Go Surfing. Thanks to John from APOLA for delivering every year a great day! Sound fun and want to work with us? Check out our Jobs Page.